MET is Mission Elapsed Time, or the number of seconds since the begining of the flight. DeltaV is basicaly the fuel you have left. When it hits 0, you're out of fuel. Budget is the funding you have left. You continualy drain funds as your mission costs money to go on. You gain funds by fly-bying or orbiting moons and planets. Novelty is more rewarded than old stuffs, so keep exploring to make your journey last longer. Your score depends of you accomplishements. 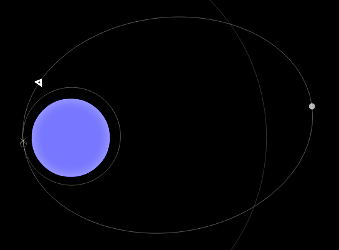 Like fund gains, you'll get points if you fly-by or orbit celestial bodies. Here is where you enter and manage your probe's commands. In the "New Command" box, you set up the time (relative to MET), direction, and deltaV of a burn. Clicking on "Add" will add the command to the command list above the "New Comamnd" box. You can modify any command already added to the command list. 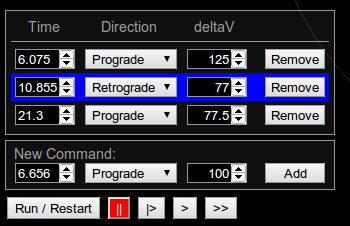 Once you're done editing your probe's commands, click on the "Run / Restart" button to apply the changes and see the effects on the probe's path. Next to the "Run / Restart" button are time management buttons: you can either pause the game, make it play in slow motion, at normal speed or ten time faster than normal. You can also control the time speed with the left and right arrow of your keyboard. The next command to be executed is highlighted in blue. It switches to red one second before being executed. The event console logs meaningfull information during the flight. For each event, you can click the time of the event. This time will be copied into the time entry of the "New Command" box, allowing you to plan precisely timed burns, for example at periapsis. The trajectory prediction only takes into account the body you're currently orbiting (that is, the body you are currently in the sphere of influence). It means that the prediction can be wrong if your probe comes close to another body, where gravity influence of the other body is strong. measure of the amount of 'effort' that is needed to change from one trajectory to another.